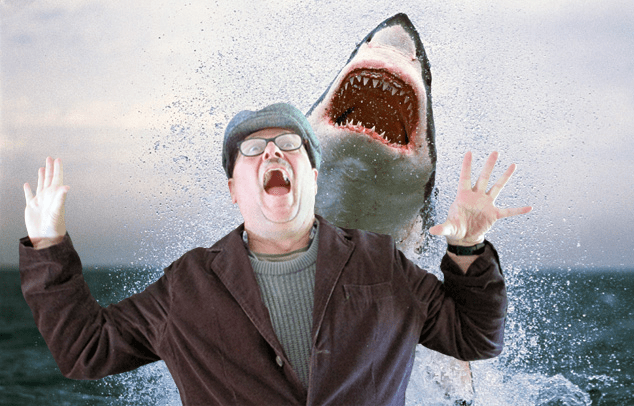 My Encounter With A Great White Shark! The Twenty-One Foot Man Eater Nearly Got Me! Well, I could pretend this was a wild fishing expedition on the Atlantic Ocean, just off the coast of Florida somewhere, but let me be honest. The green screen, also known as chroma key, arrived in the mail and I’m having some fun with it. The photo reminds me of the 1975 film Jaws, especially the gruesome scene where the shark hunter Quint gets bitten and swallowed up. Quint’s blood was spewing all over the screen, as terror prevailed on that dreadful day. I vividly remember someone making a comment about the possibility of the decline in swimming activity on the beach. It was a powerful moment. You had to have been there. Problems with the mechanical sharks occurred during the shooting, if I remember correctly. By the way, if you’re interested how my green screen worked, it worked really well, even with a few wrinkles in it. However, I did pick up some wrinkle release spray, which did take some wrinkles out, and the smell of the spray was delightful. If you enjoy photography, even amateur style like myself, the green screen is certainly the way to go. Instead of taking yourself to the studio, bring the studio to you.